These next few days could not come any sooner. I am spending the holidays in Kansas, and I cannot wait. What’s in Kansas, you ask? Well, Karl, his sweet family, and of course, Arthur Bryant’s. I have a long to-do list to complete before I leave. I just crossed one thing of my list, and that is make holiday cookies for my Boston pals. I love making gifts during the holidays. I think homemade gifts are a great way to show someone you appreciate them any time of the year. In my opinion, you get bonus points if they are edible. I made these delicious snowflake sugar cookies for my dear friends and coworkers. The snowflake cookie cutters are from Sur La Table, and I piped on the icing with Wilton’s #2 tip. With an electric mixer, mix the butter and sugar on medium-high speed until smooth, about 4 minutes. Add the eggs, one at time, and vanilla extract. Reduce the speed to medium-low and add the flour, baking powder, and salt. Mix until just incorporated, stopping once or twice to scrape down the sides with a rubber spatula. Cover the cookie dough with plastic wrap and refrigerate for 1-2 hours. Sprinkle some flour on a clean surface, and knead the cookie dough on the floured surface 6-8 times. Roll the cookie dough with a rolling pin until it's about ¼ inch thick. Sprinkle and gently rub the top of the cookie dough with some flour. With a cookie cutter, cut out the dough and place on the prepared baking sheet. Bake for 6-7 minutes. Allow the cookies to cool on the baking sheet for 8-10 minutes, then transfer to a wired rack to finish cooling. Combine all the ingredients in a large mixing bowl. Mix on high speed until smooth, about 5 minutes. For thinner icing, add more water, 1 teaspoon at a time. Pipe or spread on cooled cookies. This entry was posted in Desserts & Sweets and tagged cookies. Thank you Christina! We are definitely on the same page about homemade gifts (: I’m so glad you feel the same way too! The cookies are so beautiful, and sound absolutely delicious! These would be such a wonderful gift to give and get this season. These are gorgeous! I love homemade gifts too! I actually sent out some snowflake sugar cookies too! I have been itching to try out royal icing! Yours is gorgeous! Connie, these are gorgeous cookies! I love how you decorated them – they are so pretty! I can just imagine receiving these as a gift in the mail – such a treat! Thank you so much Kristi! Decorating was a lot of fun, but so much more work than I had anticipated!! These are beyond gorgeous! I just love how perfect the sugar cookies look and the way you decorated them is so pretty and professional! I think I need some of your awesome decorating skills. LOL. Pinning! These look way too perfect! I love sugar cookies this time of year! I hope you have a wonderful time in Kansas, Connie! These sugar cookies are absolutely gorgeous! I love how you decorated these. Sounds like your friends in Boston will adore these! Home-made gifts are definitely the best. Thanks for sharing! 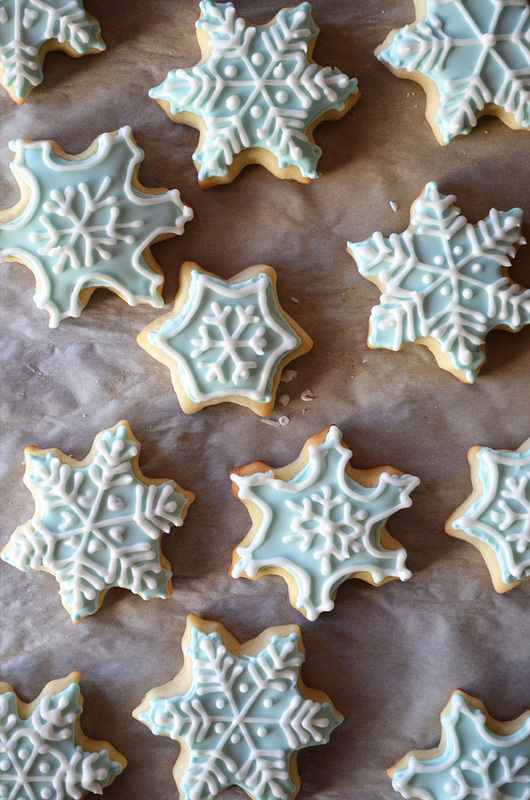 These cookies are so pretty with that flawless royal icing! I’m usually too lazy to do royal icing, but it really does look so much nicer. Have a nice time in Kansas! Thanks Marcie! Royal icing can be a lot of fun to use (: The only problem for me is that it dries so fast, so breaks are not allowed! These cookies are gorgeous, Connie! They are the perfect holiday treat. Oh my goodness, these cookies are absolutely stunning, Connie!! You decorated them beautifully and they look just perfect!! Anyone would be super lucky to get these as a gift! Love them! These look great, Connie! I hope you have a wonderful time in Kansas! These cookies are beautiful, I love your decorating! I actually really love the simple drizzled ones, I think they’re so pretty! Homemade, edible gifts are the best! Thank you for your sweet comment, Cailee!